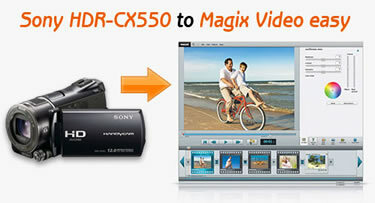 Home » Useful Guide » How to Edit Sony HDR-CX550 MTS in Magix Video easy? The MTS videos from the Sony HDR-CX550V are either 1440x1080i or 1920x1080i. There are interlaces on the videos and MTS format can not import to Magix Video easy for editing. Fortunately, Aunsoft MTS/M2TS Converter is a great Sony HDR-CX550 to Magix converter. You can use it to convert the HD MTS files to MPEG-2 HD, and edit the .mpg on Magix for uploading to websites like Vimeo, Dailymotion and YouTube. Here is the step-by-step guide for other Magix users, who encounter problem editing MTS in Magix. The converter help deinterlace AVCHD for smooth playback. Step 1. Load Sony HDR-CX550 HD videos to Aunsoft MTS/M2TS Converter. Run Aunsoft MTS/M2TS Converter as Sony MTS to Magix converter, and click the "Add" button to load Sony AVCHD .mts videos for conversion. Step 2. Choose HD MPEG-2 output format. Click the "Format" option, and choose HD Video > MPEG-2 HD Video(*.mpg) for converting HD .mts to 1920x1080 .mpg. For videos recorded at 1440x1080, just choose the profile and click the "Settings" button to choose 1440x1080 as resolution. Step 3. Convert Sony HDR-CX550 to MPG for Magix. Click the convert button under the preview window, the Sony MTS to MPG converter starts converting my .mts to MPEG-2 HD for Magix Video easy. After conversion, just import .mpg videos to Magix Video easy. The video quality is great, and you can make 1280x720 .mp4 for Vimeo, Dailymotion and YouTube. How to put and play Movie/Music on HTC EVO Shift 4G?